Looking for a light and flavourful chicken dish? Look no further. 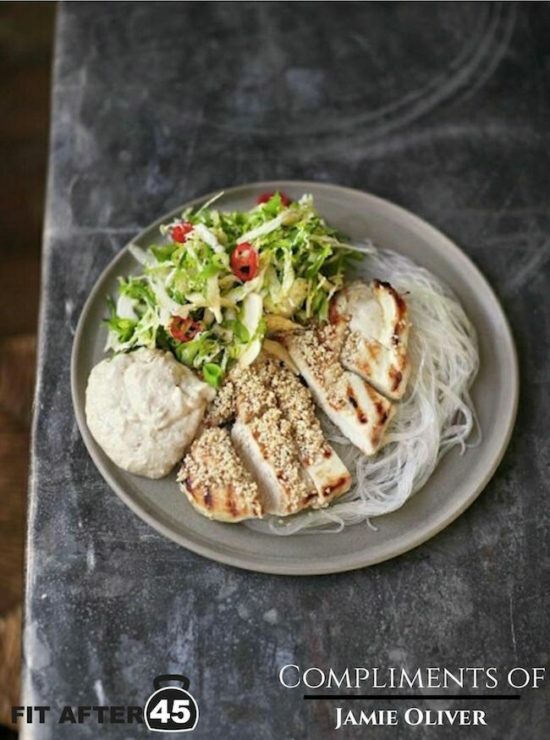 This sesame butterflied chicken recipe by Jamie Oliver is high in protein, low in saturated fats, full of flavour, and the best part – you don’t have to be an award winning chef, like Jamie, to make it! Put a grill pan on high heat. In a bowl, cover the noddles with boiling kettle water to rehydrate them. Use a sharp knife to slice into the chicken breasts, and open each one out like a flat book. Rub each one with 1 teaspoon of peanut oil and a small pinch of sea salt and black pepper, then grill for 8 minutes, or until golden brown and cooked through, turning half way. Trim the scallions and rattle them through the finest slicer on your food processor, followed by the napa cabbage, sugar snap peas, and chile. Dress with the juice of 1 lime and soy sauce. In a small bowl, mix the peanut butter with the yogurt and the juice of the remaining lime, peel and finely grate in the ginger, mix again, taste, and season to perfection. Remove the chicken to a board and slice, lightly toasting the sesame seeds in the residual heat of the grill pan and sprinkling them over the chicken before serving. Drain the noodles, divide in between your plates with the chicken, slaw, and peanut sauce, mix it all up, and tuck on in. Jamie Oliver is a famous British chef, restaurateur, author of cookery books, and media personality. The appeal and reach of many of Jamie Oliver’s dishes lies in the simplicity of his recipes and the relatively short preparation time for each of his dishes. Read more about Jamie Oliver here!